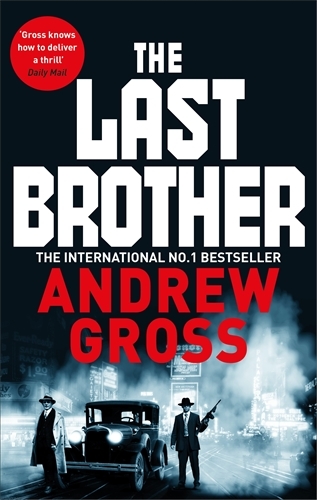 Thriller writer Andrew Gross dips into his own family history for inspiration for his latest book The Last Brother. While there is plenty of action and a little suspense this is down the line historical fiction exploring the growth of the rag trade in New York in the early twentieth century and the organised crime that grew up around it. The Last Brother opens with a tragedy. One child of a Jewish immigrant family of six children dies in an accident putting Harry, the twin of the boy who died, on a different course to his siblings. Sol, the oldest son goes on to study accounting while the youngest brother Morris at thirteen goes to work for a coat maker and his wife. The narrative proper starts years later when Morris and Sol are running a successful business and Harry is running with some petty criminals. Morris and Sol are under pressure from the unions who are backed by the local mob and when one of his fellow coat makers is attacked and his stock destroyed Morris takes it on himself to see the mob boss Buchalter. It turns out that Morris and Buchalter have a long history, which Gross then goes back to detail. Gross describes a time when the Irish, Italian and Jewish mobs had divided up the city, with the Jewish mobsters controlling the clothing trade. Harry, who Morris has brought into the company, has deep connections with the mobsters creating tension within the family. The Last Brother is pretty standard historical fiction but Gross has the thriller-chops and manages to pack in some heart-stopping action scenes and clever twists in the tale. No one gets off lightly. While the mobsters, who form part of a citywide group known as Murder Incorporated are shown to be self-interested and unnecessarily violent, Morris’s stand against them has its consequences for himself and his family. The Last Brother takes a really fascinating corner of history and vividly brings it to life. From the hum of the sewing machines, to the rattle of machine guns to the New York dancehalls. Gross explains in the afterward how this is, in a fictional way, his grandfather’s story, and the affection that he has for his characters and their plight shines through in the narrative.